A New Standard of Care — Two Implants will change Everything! 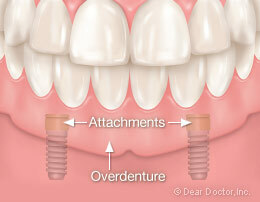 The two-implant overdenture for the lower jaw is a far simpler and equally effective solution. In fact, in the original Toronto Study (when the treatment was introduced to North America), the complaints of many patients seeking implant treatment were solved during the initial healing phase as their lower denture — fitted or relined over the implants — provided them with an increase in retention, stability and comfort. The lower jaw “overdenture” fits securely onto the two dental implants and is removable by the individual for cleaning purposes and may or may not be left out at night. Illustration showing an example of two implants for attachment and stabilization of the mandibular denture. 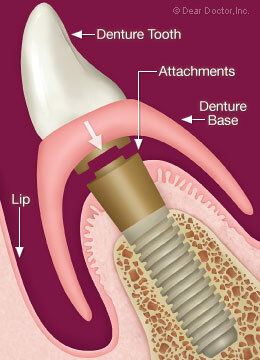 A cross-section illustration showing how the denture attaches to the implants. What is the science supporting this new minimal treatment objective? When one examines the impact of this treatment on edentulism, the results can only be defined as remarkable! Perhaps the most important consideration is that implants will significantly reduce the destructive resorptive bone-loss process — by about 75 percent less in the areas the implants are placed as compared to the use of dentures without implant treatment. Since the preservation of remaining bone structure is a major cornerstone of modern dentistry, the prevention of further bone loss is a key element in the success of overdenture treatment. Also, since most of the bone loss occurs within the first year after tooth loss, it is most ideal if implants are placed during the first year after tooth loss rather than waiting until later. Thus, the utilization of implants to preserve bone is in and of itself a sufficient rationale to recommend this treatment. While implant overdentures improve mastication (chewing), does this result in improved nutrition? When comparing the lower two-implant overdenture to conventional dentures researchers determined that altered eating habits are reflected in a comparison of blood parameters. They showed that there were significant increases in concentrations of serum albumen, hemoglobin, B12 and carotene in the lower two-implant overdenture group and no changes in the conventional denture patients. This and other clinical data suggest that providing edentulous patients with one of the least complicated forms of implant dentistry gives patients the opportunity to modify their diets and improve nutrition, which may impact their general health. Additionally, other evidence suggests that quality of life ratings for oral health are higher for individuals who receive two-implant overdentures than for those with new conventional dentures. No more loose dentures or embarrassing moments in public trying to eat or speak. Patients report an improved self-perception of facial attractiveness. This is of considerable importance, indicating that this simple implant rehabilitation may actually restore a patient's quality of life. So, you may be asking am I a candidate for this treatment? Generally, if a person is healthy enough to undergo a tooth extraction, then they are also a candidate for the two-implant overdenture treatment. The entire surgical phase can often be completed in one visit, although careful assessment and pre-planning are necessary pre-requisites. Potential candidates include the dissatisfied denture patient suffering from discomfort and lack of retention of their lower denture, as well as partially edentulous patients with severely compromised teeth that cannot successfully support a prosthesis whether fixed or removable. Research has shown that neither increasing age nor osteoporosis is a barrier to successful healing or integration of implants. Can this simple treatment be applied to my upper denture? NOT EXACTLY. Upper implant overdentures have different needs and requirements for success and predictability when compared to the lower implant overdenture. Based on differences in bone volume, density and other anatomic factors, preliminary evidence suggests that at least four, and in some cases as many as six implants are needed to retain an upper (maxillary) implant overdenture. The upper two-implant overdenture should not be considered a standard procedure at this time — more research is needed. So, the case selection is different and more difficult for the upper jaw — it is more costly and comparatively more complex. Please consult your dentist if you are considering an upper implant overdenture.